September | 2009 | Larval Subjects . Is it just me, or does dark matter and energy sound a lot like phlogiston? 96% of the matter and energy missing required to explain why galaxies move in the way they do is an astoundingly large number. 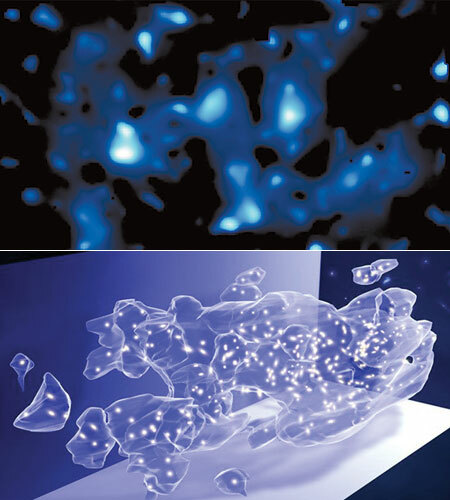 I realize that they’ve “detected” dark matter through a technique known as “lensing”. This technique is also used to detect black holes. In a nutshell, lensing is a technique whereby the bending of light is detected, allowing the astronomer to infer the presence of massive bodies like black holes that are bending the path of the light. The picture in the upper right hand corner of this post gives a sense of how this curvature appears. Similarly, dark matter is detected by tracking the curvature of light. In other words, we don’t encounter dark matter or energy directly but only through its effects on other things. Fascinatingly, physicists have actually mapped the dark matter in the universe through this sort of inferential process. It is clear that something is producing these effects, but the whole question is what this something is. And dark matter and energy are indeed strange critters that are conveniently undetectable by more direct means. It passes right through the sort of matter we’re acquainted with, and as a result is not detectable by our instruments insofar as those instruments are all constructed of the sort of matter through which dark matter passes. In a decade of research with specially designed instruments laying about 2300 meters beneath the earth (in Montana) to shield it from solar particle, we have yet to detect a single instance of dark matter. In some respects, dark matter is the perfect exemplification of object-oriented ontology, especially in its Harmanian formulation. For Graham all objects are vacuum packed and withdraw from one another. Dark matter and energy are perfect examples of this thesis. We only encounter it, in my formulation, through the differences it produces in other things. Yet here we have the interesting epistemological question of why we should affirm its existence at all. It quite literally is a ghost. Perhaps the physicist readers of this blog can help me out here. Dark matter is certainly very strange stuff. UPDATE: Over at object-oriented philosophy Graham got the impression that I was suggesting that his withdrawn objects are like phlogiston. This is my fault. I wrote this post in haste while cooking dinner and watching a documentary on dark matter, so I wasn’t as clear as I should have been. Two distinct things are going on in this post. On the one hand, I’m raising questions about whether or not something like dark matter actually exists and what reason we have for believing that it exists. To my eyes it looks a lot like an ad hoc scientific hypothesis reflective of serious problems at the heart of our physics. However, on the other hand, if dark matter does exist, and if it has the properties physicists attribute to it, then 1) it would not be equivalent to phlogiston, and 2) it would be an excellent example of Graham’s withdrawn objects. Apologies to Graham. I did not mean to give the impression that I was lampooning his withdrawn objects as phlogiston. Quite the contrary. It seems to me that Shaviro here draws a distinction between events that befall an object (its movements from place to place) and the event that an object is. 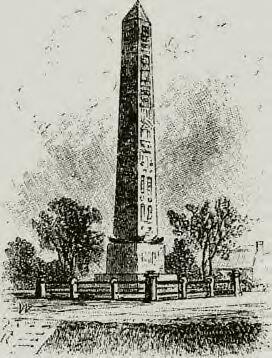 We can even go one step further than Whitehead, pointing out that it is not simply that Cleopatra’s Needle gains and loses electrons, but these electrons are themselves in a constant state of motion, jumping from higher to lower and lower to higher states of energy. This concept of objects as events is the most difficult thing of all to think. Our tendency is to think objects as substances in which predicates inhere. Take, for example, Aristotle’s categories. All of these categories are predicates that can be attributed to a substance. As I have argued elsewhere, in my article “The Ontic Principle” forthcoming in The Speculative Turn, the concept of substance responds to a real philosophical problem. 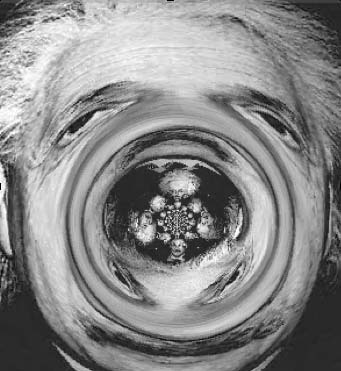 This problem is the endurance of entities through or across time as this object. I denote this substantiality of the object with the expression “the adventure of the object” to capture the sense in which objects are ongoing happenings or events. In other words, events are not something that simply happen to an object as in the case of someone being granted a degree while nonetheless remaining substan-tially the same. Rather, objects are events or ongoing processes. Apologies for the lack of posts lately. For whatever reason I’ve been feeling rather dark, worn down, and misanthropic. If I haven’t responded to your emails or posts don’t take it personally. Occasionally I withdraw into my hole and hibernate. In the meantime, Bogost has put together a terrific aggregator for blog posts relating to SR and OOO. We are pleased to announce the next event for The Inhumanities, which will be a cross-blog event with the fine folks of Speculative Heresy. Besides the participants of the two blogs and anyone we are able to recruit to respond, we are also opening up the field for answers to anyone. All answers must be 1500-2000 words, and submissions for answers must be recieved by Friday, November 13th. Inquiries can be sent to Inhumanitiesblog@gmail.com or speculativeheresy[at]gmail.com, or to the email addresses of Scu, Greg, Craig, Ben, and Nick. I hope you are all looking forward to this event as much as we are! I’m very much looking forward to this event. I will, however, say that earlier this year those of the various SR orientations had a debate as to whether trees are real. The eliminative materialist-Brassier side of this debate contended that it amounts to “folk ontology” to claim that trees are real. The OOO folk contended that reductivism fails to recognize that objects exist at multiple levels of scale and are irreducible to one another. This was treated as “folk ontology” because it was claimed that we were individuating objects by virtue of how we perceive objects. Long story short, I cannot say that I see much of use for ecology or critical animal studies coming out of the scientistic/reductive materialist side of this discussion. If we can’t even hold that trees are real objects, then I am unsure of what possible use SR can possibly be for the ecologist or the critical animal theorist. Fortunately SR isn’t exhausted by scientism and there are those that are not allowing their ideologies and emotions to get in the way of posing the question of what the being of beings might be. I sincerely hope the discussion has progressed since this last debate, however given that this variant of SR finds the existence of even trees suspect (maybe it endorses eukaryotes), I’m not sure what it might have to offer here. Progress certainly did not appear to be the case in many of the Paul Ennis interviews (which is no fault of Paul’s who’s done nothing but great work). Given the fact that there was an almost complete absence of mention of OOO and serious OOO theorists as one of the central trends or trajectories by a number of others claiming to work in SR, you can count me as skeptical about whether or not the discussion has progressed. I mean, Negarastani was claimed to be one of the three foundational works of SR, but Harman’s work wasn’t mentioned at all. I can get by the fact that I wasn’t mentioned much given that I haven’t yet published much on my ontology, but Harman? Bogost? Latour? Stengers? Whitehead? I admire Negarestani’s work as much as anyone and am not disputing the importance of his work, but I’m unclear as to how SR has anything to offer to media studies, critical animal studies, feminist thought, technology studies, or a whole slew of other things in the absence of a robust object ontology. I attribute this profound deficiency to an ontological approach too deeply wedded to reductive and scientistic materialism and Laruelle. I pretty much think Speculative Heresy is the last venue suitable to host such a discussion given their ontological orientations, but that’s just me. A storm is rolling in. The horizon looks like the battle scenes on the hill in Spielberg’s remake of War of the Worlds, when Tom Cruise is trying to pull his son back. This resembles my mood over the last few days, but strangely I feel calm. I can smell the electricity in the air. Perhaps thinkers and artists shouldn’t be evaluated by influences within their art or discipline, so much as by their idiosyncratic fetishes and obsessions that fall outside of their work. What are we to make, for example, of Graham’s obsession with Gibbon? As I read Harman’s daily posts about Gibbon, I can’t help but feel that I’m encountering something purely singular and inarticulable. As Graham himself would admit, I’m sure, there is something deeply libidinal in this obsession, a jouissance that falls outside of language, even though it seems to be all about language. If the suggestion of a jouissance outside of language that is all about language seems paradoxical, we need only think of Joyce’s final work. As Lacan observed, Finnegans Wake is a pure jouissance, a sinthome rather than a symptom. Where a symptom is either a metaphorical substitution or a metonymical displacement susceptible to interpretation, a sinthome is a jouissance that admits of no interpretation. Lacan, perhaps influenced by Deleuze and Guattari, referred to the sinthome as a haecceity. When a woman continuously has fits in public where she falls down and where there’s no medical condition that accompanies this malady, we probably won’t be far off the mark in concluding that the signifier “fallen woman” is at work somewhere in her unconscious. This symptom is a message to the Other, indicating perhaps the manner in which she has betrayed her desire. The sinthome by contrast, does not function in this way. When Lacan says Joyce cannot be interpreted, he is not saying that he is so difficult that his work defies any analysis. Clearly this is not the case. What he is saying is that the relation to language in Joyce is that of the sinthome or a pure jouissance in language itself, without this language being organized around a series of metaphorical and metonymical substitutions that would allow for an interpretive master key. And indeed, to read the late Joyce you have to read him at this level. If you are looking for meaning in Joyce’s later work (i.e., the relation between the Imaginary and the Symbolic), you’re going to be tremendously frustrated and outraged. Joyce has to be enjoyed at the level of the rustle of his language itself, at the level of the texture of that language. While the later work of Joyce is capable of producing a great deal of meaning (it’s almost like hyper-text), it does not contain pre-delineated meaning that would lie beneath the shimmer of the text as its secret key. This is what I have in mind when I refer to analyzing a thinker in terms of his or her obsessions and fetishes rather than their intellectual influences. While I am sure Graham gets all sorts of things from his forays into Gibbon, there’s something else going on here. What are we to make of this jouissance? What does it say about Graham’s jouissance? Graham has often remarked on my unusually high tolerance for dealing with assholes, for my tendency to get into ridiculous discussions and debates that are of little or no worth. What does this say of my jouissance? What are we to make of Zizek’s obsession with film or Bogost’s love of video games? Or how about Shaviro’s delight with science fiction and Harold & Kumar? We all find ways to integrate our jouissance with our work, yet jouissance is always strangely outside of that work. If someone some day writes a biography of Harman there will be endless perplexity and debate about the place of Gibbon in his thought. And that’s exactly how it is with jouissance. Beyond what is transmissible about a person, it is the haecceity of a person, never summarizable in a single feature or obsession, but fractally present throughout all acts of that person, functioning as a sort of ghostly mark of that which withdraws from all relation and interpretation. for Levi, even if we scientifically prove that material existence can be decomposed into 6 or so specific particles, such decomposition is in no way exhaustive for all being. For Levi, being is more than just materiality; it is also immateriality, fictional, and symbolic. And in this way, onticology is inclusive, slutty, or promiscuous. It does not discriminate between objects. This is mostly right. I do discriminate among objects (they come in all sorts of flavors), but I hold that all of these objects are real. There are a wide variety of realisms and it is important to keep this in mind. Platonic realism holds that Forms or universals exist in their own right, and are not just abstractions of mind. This differs from Aristotle’s particularism that holds that only particulars exist and universals are just abstractions. In addition to Plato’s realism and Aristotle’s particularism, you also have materialistic and physicalist variants of realism. Thus the materialist or physicalist will claim that only material things are real. Everything else is to be explained in terms of this fundamental reality. My realism is a promiscuous realism. I do not wish to claim that fewer things are real, but rather I wish to multiply the number of real things. The more real beings the better as far as I’m concerned. Or as Latour so nicely puts it, we shouldn’t strive to make things less real, but more real. What does he mean by this? This point can be nicely illustrated in terms of the modernist project of critique. In this connection I cannot recommend Latour’s We Have Never Been Modern more emphatically. Yes, sometimes he is thin on argument. Yes, often he is unfair. Nonetheless, he presents, in my view, a compelling critique of modernity. Modernity, as Latour understands it, consists in drawing a strict distinction between nature on the one hand (the physical world) and society on the other hand. The project of modernity is to purify these two domains. Thus, where there is only a single world for the premoderns, where the social and the natural are not clearly distinguished, modernity posits two distinct ontological domains that are never supposed to cross: the ontological domain of nature and the ontological domain of the social.